To create an extraordinary piece of art is a coordinated effort both of skill and creativity right from its inception to its completion. Any artistic rendition is a complex interplay of different elements coming together such as the subject, background, colours used, use of light and shade, symmetry, etc. Artists painstakingly work with all these elements to finesse their work of art into a masterpiece. However, from a spiritual perspective there is one more factor that is vitally important in making a true masterpiece in every sense. This is the subtle ability of the artist in being able to perceive the subtle vibrations being emitted by the various elements in the artwork to finally emit spiritually positive vibrations. This is because there is no point creating artwork however complex and aesthetically appealing if it emits negative vibrations as it has a spiritually detrimental effect on the observer and the surroundings. When an artist has good subtle ability, he is then able to better discern how bright the art should be, what colour the background should be and how the objects in the art should be arranged so that the artwork can have a positive impact at a vibrational level. SSRF and MAV have undertaken considerable research into how to create spiritually purer art where creativity and skill are tempered with advanced sixth sense to draw out the full spiritual potential of the artwork. In this article some of the key findings are presented in relation to creativity and conceptualisation of art. 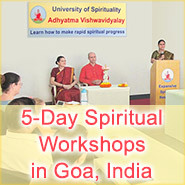 It provides artists with practical steps to direct their creative ability towards accomplishing spiritually purer art. Colours are a very important aspect of any artwork. 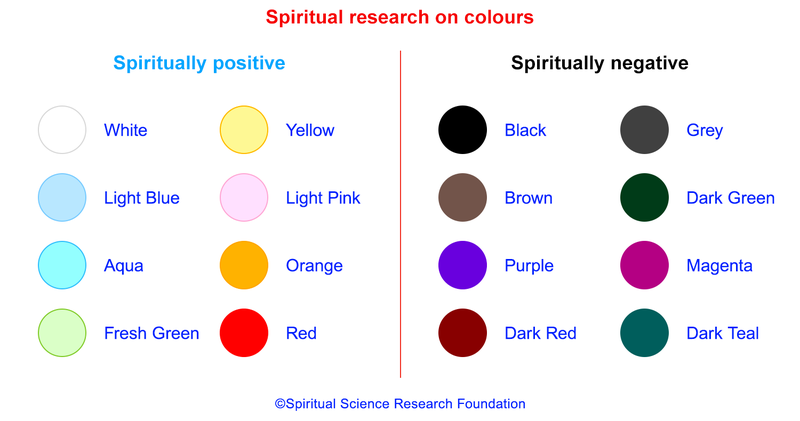 In our article on colours, we have gone into detail in explaining how different colours have different levels of spiritual purity. More sāttvik or spiritually purer colours include lighter colours such as white, yellow, light blue and light pink. Colours such as dark brown, dark grey and black are more tāmasik or spiritually impure. A work of art is impacted at the spiritual level by the colours used in it. When an artist uses sattvik colours in a work of art, it adds to the spiritual positivity of the work. Thus, rather than choosing what colours to use in a work of art based on what is visually pleasing, it is recommended spiritually to use lighter colours whenever possible. Spiritual research has shown that in the current era also known as (Kaliyug) or the Era of Strife, negative energies are far more active in the environment. When any artwork has a higher proportion of spiritually impure colours in it, it starts to emit negative vibrations which then attracts negative energies. Thus, a piece of art that has spiritually impure colours is more easily affected by negative energies. This makes such works of art lifelong transmitters of negative energy. It is common to use light and shade in paintings to illustrate depth and provide perspective. Artists often consider this to be a part of their artistic license. However, it has been the research team’s experience that minimal use of shadows increases the overall sāttviktā (spiritual purity) in a picture. To highlight this point, in the pictures below, the same person has been shown with different gradients of light and shade. What do you feel when looking at pictures A, B and C? When the spiritual research team took a subtle-reading, the picture on the far right where the entire face is illuminated evenly gave the most positive vibrations. The use of directional lighting on a subject creates shadows, which increases the subtle negative vibrations emitted by the picture. So, when painting a person’s portrait its best to paint him or her looking directly at the viewer with the light source straight ahead evenly illuminating the person’s face. This principle can be applied to photography and videography as well. The background of a painting also affects the overall sattvikta. The following points can be kept in mind when painting a background to enhance the spiritual purity of a painting. The background should be of a sattvik light colour. This is because when darker tones are used in parts of the background it emits negative vibrations. The entire background should preferably be of the same colour. This is because gradients can emit negative vibrations. The background should be evenly illuminated. This means that it is best to avoid creating the illusion of directional lighting. Backlight or illumination in the background should be avoided. Sometimes an artist may compose a background with various elements in it. In some cases, this may be necessary and adds value to the painting overall. However, the drawback of such a composition is that if any of the elements emit negative vibrations, it can reduce the positivity of the picture. The background should not disturb or draw attention away from the subject. Symmetry has been always been advocated as an important aspect of art. When a design or the elements within a painting are laid out in a symmetrical manner, it increases the positivity of the artwork. An example of two similar designs, where one is symmetric, and the other is asymmetric, is provided below. Of the two designs, design B emits better vibrations as it is more symmetrical. As per spiritual science, when the design is symmetrical the vibrations created and emitted are spiritually positive. Contrarily, when the design is asymmetrical then the vibrations emitted are haphazard and are spiritually impure. This therefore impacts the overall vibrations emitted from the artwork. Art by nature is a creative pursuit. Every artist employs different elements of art in their own way to bring out a distinctive flavour to their artwork. Every key element of art like the colour, background, subject, symmetry, etc. has vibrations associated with them. When the combination of these elements in done in sync with spiritual science, the artwork emits spiritually pure vibrations. When artists create art as a part of their spiritual practice under the guidance of an evolved spiritual guide the artwork becomes a medium to emit spiritually pure vibrations and benefits society at a spiritual level. Art created in this way endows the artist and observers with the experience of Bliss, which is far above and beyond the satisfaction or happiness one would experience from creative art made without such a spiritual basis. 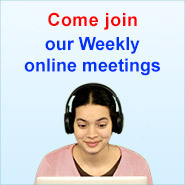 What are spiritual root causes of problems in life ?